Ubuntu One is designed to bring digital life together to enjoy digital content, the way your prefer and from any where you desire. Ubuntu One was launched in May 2009 by the developers of Ubuntu, one the world’s most acknowledged free operating system on Linux platform. 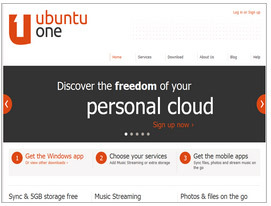 Ubuntu One is commercially backed by Canonical. Ubuntu One provides immediate access to all your music collection, favorite images, HD videos, confidential documents and every other file you have stored on cloud account. In addition to low price storage space, every little revision on your file will be securely updated on cloud account via automated synchronization. Sharing and streaming of your files allows you to enjoy the privilege of having your data on fingertips through any device. Development team at Ubuntu One has paid special attention to devise simpliest of the solution, which can be easily operated and fully utilized by non technical consumers. Ubuntu One team is spread across North America, Europe and Asia – working continuously for the betterment of online services. They thrive on delighting users with feature rich services to solve real problems and assist you in getting your things done. Ubuntu One has employed over 400 people in 30 countries to produce a faster, easier and more intuitive version. They have regional office in Boston, Taipei, London & Montreal. @boneshakerbike Hi, could you submit the form at http://t.co/B06wlbKlI9 so we can get some more information from you?